In 1892, before they had the right to vote, Washington women selected the coast rhododendron, Rhododendron macrophyllum, as the state flower. They wanted an official flower to enter in a floral exhibit at the 1893 World's Fair in Chicago. Six flowers were considered, but the final decision was narrowed to clover and the "rhodie," and voting booths were set up for ladies throughout the state. 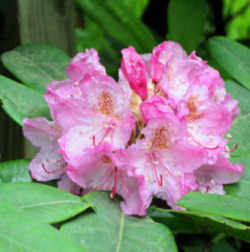 When the ballots were counted, the rhododendron had been chosen as the Washington state flower. In 1959 Washington officially adopted coast rhododendron (Rhododendron macrophyllum) as the state flower; though originally selected in 1892 for 1893 World's Fair in Chicago. Rhododendron macrophyllum, the Pacific rhododendron, coast rhododendron or big leaf rhododendron, is a broadleaf evergreen Rhododendron species native to western North America. It is a shrub growing 2-9 m tall. The leaves, retained for 2-3 years, are 7-23 cm long and 3-7 cm broad. The flowers are 2.8-4 cm long, with five lobes on the corolla; color is usually pink, although variants exist. 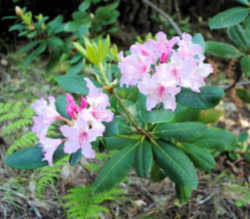 This species, like many rhododendrons, thrives in disturbed habitats such as roadside embankments and recently deforested wildlands. Archibald Menzies found this shrub growing along with Arbutus menziesii in May 1792 when he and George Vancouver made their second landfall after leaving Hawaii, near present day Port Discovery, Washington. Seed was sent to England in 1850 by William Lobb. The Evergreen State's Official "Coast Rhododendron"
More than a hundred years ago, the Washington State Senate confirmed that the "Coast Rhododendron" (Rhododendron macrophyllum) would be the new floral emblem for Washington state. 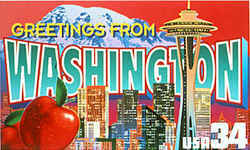 One of my required courses prior to graduation from high school included Washington State History. 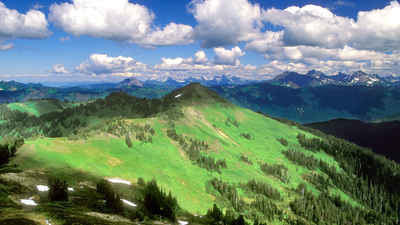 However, my mental recollection fails me about whether we learned much, if anything, about Washington state's flowers. Having lived in the beautiful state of Washington most of my life, I decided to do some research about how, when, and why this gorgeous rhododendron was chosen for this honor. I invite you to accompany me on a journey back in time to the year 1892, before women even had the right to vote. Delegates from each state had been invited to attend the 1893 World's Fair which was to be held in Chicago. It was suggested that each state decorate their booths with their official flower, if they had one. evergreen leaves led her to nominate it (in writing) to the editor of a newspaper. Following the distribution of the ballots and completion of the voting process, 53% of the 15,000 women who voted favored the "coast rhododendron." 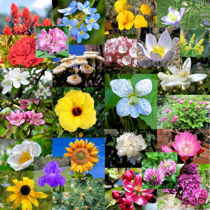 Thus, the new floral emblem for Washington state was confirmed on February 10, 1893. Fifty-six years later on February 10, 1949, it was made official by the state legislature. In 1959, that law was amended to define the "native pink rhododendron" (R. macrophyllum) as the official floral emblem of Washington state. The law designating the Rhododendron macrophyllum as the official Washington state flower is found in the Washington Statutes, Title 1, Chapter 1.20, Section 1.20.030. Title 1 - RCW GENERAL PROVISIONS. Chapter 1.20 - RCW GENERAL PROVISIONS. The native species, Rhododendron macrophyllum, is hereby designated as the official flower of the state of Washington.